For those of you tracking my busy-ness, we’ve just closed a major chapter. 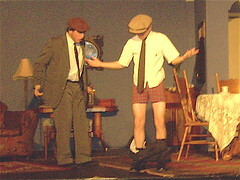 I direct the play at school every year – this is my third. We did *[Lost in Yonkers](http://en.wikipedia.org/wiki/Lost_In_Yonkers)* by [Neil Simon](http://en.wikipedia.org/wiki/Neil_Simon) this year and the show ran last week, Wednesday and Thursday. There were eight weeks between our first rehearsal and our opening night, and that is not very much time. The show has a cast of seven and, let me tell you, they worked like slaves for most of that time. When we do difficult, long-term projects, we (or I, anyway) tend to focus on the negatives, on the problems, on the things that need fixing, and not on the stuff that’s working. It’s only once things are over and done with that we can sit and look back over the entire process to see what went right. Let me tell you, this one went right. These seven students (and about six technicians) produced a superior show, one that I was proud to be associated with. Our audiences are always kind, but, this year, we blew them away. The play is usually the highlight off the school year for me, personally, and I’m still feeling the good vibes from this one.